September 01, 2008 by Alphageek in "Elijah Craig 18 eighteen year old boubon alphageek"
Ok, it is time for some more bourbon discussions. Here, we have one of my favorites. Ok, maybe I say that quite often but I really like most bourbons. Yet again, this bottle is half empty buy the time I get a chance to take a picture of it. This is the bourbon I buy when I am with some folks and they say "I don't like bourbon". This bourbon is aged eighteen years. The aging removes almost any harshness from the bourbon. 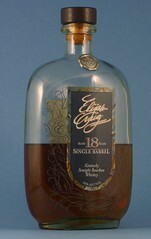 Elijah Craig eighteen year old might possibly be the smoothest bourbon that I have ever enjoyed. While I was drinking this bourbon, I did notice that this bourbon tastes almost oak like, somewhat like a wine that has been aged in an oak barrel. I guess eighteen years is about the longest a bourbon can be aged and not pick up too much of the oak flavor from the bourbon. I highly recommend trying this bourbon. Just let me know when you would like to try some. "Elijah Craig 18 eighteen year old boubon alphageek"